Victory in Europe: End of WWII - TEAR DOWN THIS WALL! Twenty-four years after President Kennedy declared that he was a Berliner, Ronald Reagan came to the city to celebrate its 750th anniversary. By this time, Mikhail Gorbachev was leader of the Soviet Union and was developing a working relationship with the American president. They had, among other things, discussed peace and reducing nuclear arms. General Secretary Gorbachev, if you seek peace, if you seek prosperity for the Soviet Union and Eastern Europe, if you seek liberalization: Come here, to this gate! 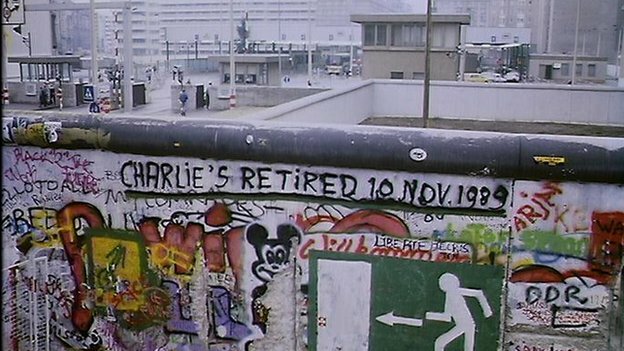 On the 9th of November, 1989, the government of East Germany opened checkpoints along the Berlin Wall, allowing East Berliners to freely travel to West Berlin. Two days later - on the 11th of November - the first slab of the wall’s concrete was removed as a crowd of thousands cheered. The next day, the wall was opened at Potsdamer Platz - once a busy European crossroad. The Brandenburg Gate was finally opened on the 22nd of December, 1989. On Christmas Day, Leonard Bernstein conducted an international orchestra as musicians from five countries performed Beethoven’s 9th - the "Ode to Joy." (Follow the links to watch it.) One hundred million people, in twenty-two countries, heard the broadcast. Heard louder than the broadcast, however, was the will of the German people. They - not the Potsdam conferees or subsequent rulers - had the final say. (1) A photo of the Berlin Wall, at the closed Brandenburg Gate. 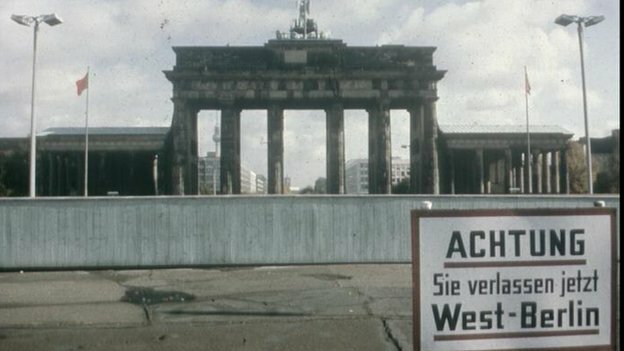 Translated into English, the sign says "Attention - You are now leaving West Berlin." (2) "Checkpoint Charlie," located in the American sector of West Berlin, was no longer needed when the German people tore down the Soviet-era wall which separated their city into East and West. Bos, Carole "TEAR DOWN THIS WALL!" AwesomeStories.com. Nov 01, 2007. Apr 25, 2019.